A history of watchmaking expertise reflects off every piece put together by the long-standing master watchmaker. Since 1832, Longines, based out of Saint-Ilmier in Switzerland, has crafted top of the line timepieces for both men and women. Longines has a long-standing devotion to tradition, elegance, and performance and can be characterized by its winged hourglass logo. Longines partners with many international sport federations as a timekeeper for world championships because of its long-standing quality and commitment to accuracy and time. 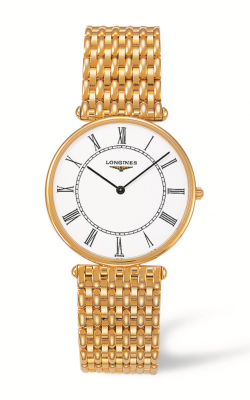 For those looking for a quality timepiece with resounding style, Longines has a watch that will fit for you. Longines has a storied history with many astounding collections under its belt. These are a few of the popular collections you can find in our showroom at Merry Richards Jewelers. The La Grande Classique Collection offers watches with a slim build for the elegant luxurious look. These classic timepieces for both men and women are timeless and will reliably stay in style. For those looking for the ultimate in the Longines line, one can explore the Master Collection, which blends the exceptional elegance and quality of Longines and places it into some of its most sought-after timepiece designs. Another collection which highlights the Longines’ drive for quality and style are their Flagship watches, each watch fitted with top of the line technology in its self-winding caliber, designed for lovers of the classic. With a wide range of dials and selection of sizes, you are sure to find the watch that suits you. Outside of these collections, are watches meant for those at the top of the horological scene. The Conquest Collection boasts watches that stick to the brand’s truest of values of elegance, tradition, and performance. With each watch designed to not only provide the utmost top in timekeeping, but in style and fashion as well. The Conquest Classic was even the official watch of many top sporting events. For a watch that takes inspiration from the Longines historic past, the Heritage Collection uses some of Longines most historic designs and elements from some of its classic timepieces and equips them with cutting-edge watchmaking technology. This collection is an inspiring tribute to Longines past, while outfitting classic designs with current watch technologies and capabilities. Why Shop for Longines Watches at Merry Richards Jewelers? Located in Oakbrook Terrace, Illinois, Merry Richards serves the finest in luxury jewelry and offers only the finest jewelry and bridal collections. We are outfitted and serve only the highest quality diamonds in our exquisite showroom. Both Merry and Richard personally travel to major cutting centers around the globe to get to the source of every diamond. Our staff is also fitted with expert designers on-hand who can create and bring to life you dream custom engagement ring. We carry a long list of luxury timepieces and watches in our top-of-the-line showroom and will help you find the luxury timepiece of your dream.